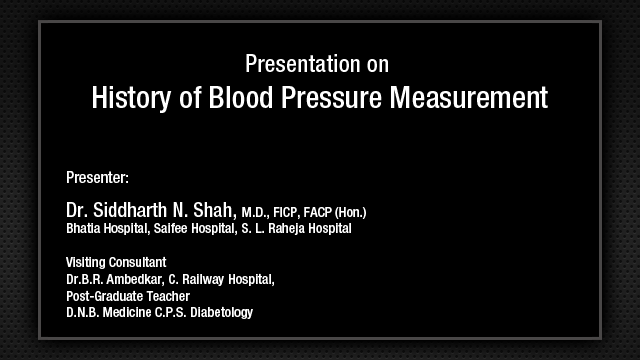 Dr. Kamal K. Sethi: Goal blood pressure in a patient with supine hypertension and symptomatic postural hypotension and drug of choice? Dr. J.P.S. Sawhney: Difficult clinical situation. We do you see that in very elderly population that when lying down blood pressure is high and on sitting and standing blood pressure is low. The goal remaining same as we say, but in those situation where those have got autonomic dysfunction which is the basic cause of this type of clinical phenomena, I think it is better to treat them, this what we have seen and we have really failed. In fact, many a time they had a fall because of this phenomena, so we train them about the tilt table training phenomena. This is one of the very important method by which we give them training for few weeks. Secondly, we ask them to use stockings, mineralocorticoid supplements has been given to this group of patients to avoid postural hypotension and try to avoid a group of drugs which are known to cause postural hypotension. Many, many times we have seen patient’s are on the drugs for prostate management, not only the alpha blocker as alpha blocker people are using less now, but some of the patients are on that, but even the drugs like Urimax group of drugs and other thing which they found that they cause significant increase in postural hypotension, so centrally acting drugs, diuretics, and those group of drugs should be avoided. We should use beta-blocker and ACE inhibitors receptor blocker and smaller dose of combination and trying to give them training. So it is a very difficult clinical situation in practice but this is the way we treat the patient. Dr. Kamal K. Sethi: I will just add something to that. This question is very specific as to what should be our goal blood pressure? The goal blood pressure in the patient with postural hypotension is governed by the blood pressure in standing position because you cannot have the target blood pressure in supine position. If you produce 140/90 in supine, the patient has 30 mm drop, he stands up and he will get unconscious. So it is very clear that apart from the precautions that Dr. Sawhney has advised, one should not, you know, aim at ideal blood pressure in supine position because it is practically not possible and get the goal blood pressure in whatever level of pressure that can be achieved without causing postural hypotension symptoms, even though there may be some degree of postural hypotension which is unavoidable. So long as the patient does not remain symptomatic with it, that is the level in standing position that one has to check. Second point I want to make here is that when you are looking for postural hypotension, there are two or three type of responses that are recorded in patients. There are individuals who will get postural hypotension immediately on standing and there are some who will get it in one minute or one and half minutes and there are some who will still get it slightly later. So, therefore many times people will come and complain to you that when they are traveling in their car and they get out of the car they feel dizzy. This is a typical complaint that the patients make. So you have to measure the standing blood pressure immediately on standing 2 minutes and if possible and if you have the patience at five minutes, but at least two readings must be taken. QUESTION FROM AUDIENCE: My one question to Dr. Prashant. Can you tell us the last slide what you just omitted? Dr. Prashant Rajput: See, the treatment is individualized. Studies are our guide, but treatment needs to be individualized. So, the last slide was how we approach? If you have a patient who is proteinuric, that is what we get, proteinuric who is diabetic or a hypertensive, which would be the first choice? In a proteinuric diabetic patient with hypertension it is angiotensin receptor blocker. Try to start with low doses, check creatinine after 5 days, check creatinine after 10 days, and then do a monthly creatinine. If the pressure remains under control continue the drug. If the pressure still remains high the next choice remains cilnidipine. Why cilnidipine? This is a very, very good drug which would reduce proteinuria. When you combine it with telmisartan, all the side effects of the telmisartan, especially the afferent arteriolar vasoconstriction, that goes away with cilnidipine. There is no renin release. The blood pressure becomes more and you have an additive proteinuria reduction. Now, we have approximately in stage II, stage III CKD, we must be having some 1000 patients who are on cilnidipine in combination with ARBs. They do fantastic. The adverse effects, especially rise in creatinine with alone telmisartan, yes, if you continue to increase telmisartan. We have used telmisartan to a dose of 240 mg and there you get a problem, but if it is in combination with an ARB, then the reduction in the blood flow to the kidney that does not happen, chances of the patients getting rise in creatinine is not there with an added advantage of these patients getting a lower reduction of proteinuria. What is our aim? Our aim is to have a very, very slow progression of chronic kidney disease which comes from a better control of blood pressure, which is the only thing which has proved along with reduction in proteinuria. These are the 2 only things which have proved to slow down progression and that remains the goal. If the patient is edematous and if the patient inspite of cilnidipine because cilnidipine with the telmisartan very rarely we get edema. Dr. Shetty will agree with me. Cilnidipine with telmisartan, the risk of edema is very less because the afferent arteriolar vasodilation, it is significantly less with cilnidipine as compared to amlodipine. So, edema is less. Very rarely we need to have third drug on board if essential, but in patient with CKD we may have multiple drugs. The third choice rather than a diuretic still remains an alpha blocker but we will individualize it based on a PRA. If the pressure remains uncontrolled with cilnidipine with an ARA combination we will do a PRA. The first thing is a PRA. The second thing is we will do 24-hour urinary sodium. Essentially, our diet is full of salt and if you have salt intake more than 5 g per day then the antihypertensive effects of antihypertensives get abolished and then we have to reinforce on patients. If the 24-hour urinary sodium is more than 80 we need to cut down on the salt to less than 5 g per day, do a PRA and if the PRA is high then we further have to increase the angiotensin receptor blocker and add an ACE inhibitor along with a calcium channel blocker. If the PRA is very low, then we add a drug which is either diuretic or an alpha blocker that is how we approach. That is a very, very ideal way to approach because then you approach the patient more physiologically rather than randomly adding drugs and subtracting drugs. Dr. Kamal K. Sethi: I think Prashant you have you know opened Pandora's box in this. I am very happy you actually brought in Laragh hypothesis back. We used to read about it in late 70s and early 80s that patients will either have high plasma renin activity or they are volume dependent hypertension and that is why you know elderly respond better to diuretics and calcium blocker because they loose their plasma renin, you know as a normal physiologic thing. The problem is that then it got bombarded with so many drugs and literature that this concept completely went away because it was not a practical proposition to measure plasma renin activity in every hypertensives that is point #1. The point #2 is measurement of plasma renin activity is very cumbersome process and it is an absolutely non-standardized investigation. You know you start collecting samples in all corners of cities and states and remote villages of the country simply because somebody is advertising pathology and then you send the samples and you get all sorts of funny reports. Not only that it is not a practical thing to do whereas in a specialized hypertension clinic, yes. When the patient is not getting control inspite of a proper combination, you know most of the time you have to use your clinical judgment as to whether this patient is high renin activity person or is a volume dependent hypertension. Based on like the first case that you presented today, 90-year-old man, obviously he was on a wrong combination of drugs. You did not require to do a plasma renin activity in that guy. I would have put that person on chlorthalidone straight away or any other diuretic for that matter and it would have fixed the matter. 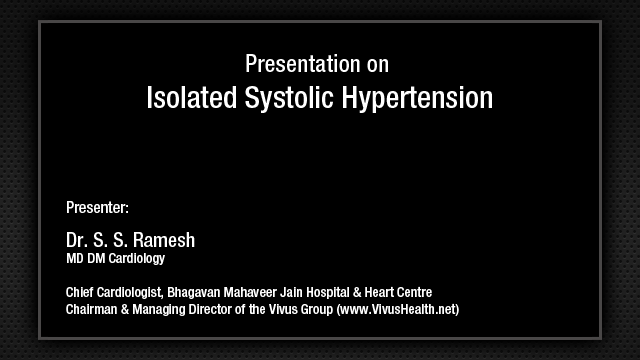 He is volume dependent hypertension. He is a 90 kg, ask him to loose weight, stop his salt, his pressure will come down. Similarly, you know, in a difficult situation yes. But plasma renin activity measurement is neither mentioned by any standard antihypertensive guideline as a measurement tool nor as a diagnostic tool except in nephrology clinics where you need to measure 24-hour urine sodium, plasma renin activity, and even the aldosterone level. Like you mentioned, yes, they need to diagnose the hypoaldosteronism. You need to do the ratio between the aldosterone and renin activity agreed, but let me also tell you that a large majority of primary hypoaldosteronism patients do not have hypokalemia. They have normal serum potassium level. You add spironolactone to the treatment and they get fixed. Dr. Prashant Rajput: We started doing PRA is, we had series of patients whose blood pressure would remain uncontrolled and once we started doing PRA, we found that there were some subsets of patient who had a very low PRA and these patients with low PRA, normal sodium they turned out to be primary hyperaldosteronism. Dr. Kamal K. Sethi: That is one of the thing if you have resistant hypertension. Dr. Prashant Rajput: 10% of resistant hypertension as Dr. Pahalajani said that 10% would turn out to be hypertension which has a potential cure, you give Aldactone and the patient is cured of hypertension and that is why this test is important. It has be done in specialized centers. How we do PRA? What we are doing is we ask the patient to discontinue all renin drugs for at least 48 hours. Ask them to come empty stomach without tea or coffee. There is a room, we ask them to sit for 15 minutes and draw a sample. It is such a simple test but it has to be done by the same person again and again and they have to be trained. Dr. Kamal K. Sethi: You see you are talking of one clinic, we are talking of a population. That’s the difference. You have been specialized, that is way it is written. If you look at resistant hypertension guidelines at the end of the table they say you add spironolactone, you do this, you do every thing, still uncontrolled, refer to a specialized hypertension clinic and that is what it means. You cannot just recommend plasma renin activity to all and sundry. Yes, in the specialized clinic, yes in a nephrology clinic, yes I agree. QUESTION FROM AUDIENCE: Maybe there is just a small subset of patient that Prashant is talking about. I have just one observation to make. I see lot of obese patient like you have the case I. They have a high BMI and they are apneic and we treat the apnea with CPAP and BP starts to come under control. Now, I need a comment on that. I do not know what the mechanism is. Dr. Prashant Rajput: Mechanism is activation of sympathetic nervous system. Dr. Kamal K. Sethi: It is expected to come under control. Problem is most people do not use the CPAP or the BiPAP. They are very vary of using it despite of the fact that you try to convince them to use it, they do not do it. Dr. Prashant Rajput: People use one hour at night. Dr. Kamal K. Sethi: They have chronic elevation of sympathetic nervous system. Dr. J.P.S. 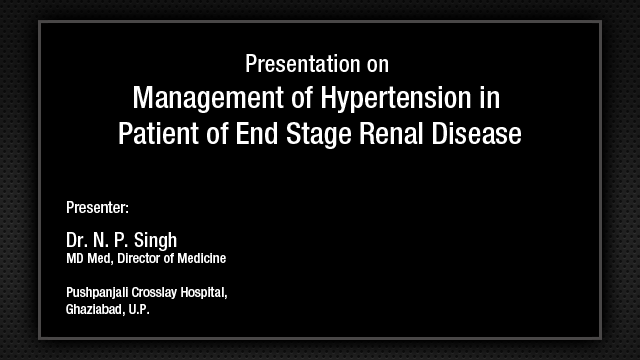 Sawhney: Gangaram Hospital, 200 patients, stage I hypertension patient, we have withdrawn all the antihypertensive drugs from a sub group of them, at least 30 to 40% pressure after using CPAP, which has been used by only 50-60% of the patient, not more than that. Secondly, the use of the nonsteroidal anti-inflammatory drugs, pain killers, various other drugs, excess of alcohol, smoking, I mean these are all other common reversible causes of hypertension one should look in clinical practice. Dr. Kamal K. Sethi: The other thing is that Dr. Sawhney has completely eliminated beta-blocker from his presentation. There are two points that I want to make you know with all respect and apologies both to him. 1. That I am still an ardent fan of ACE inhibitor because of the cardiovascular protective effects and there are doubts on cardiovascular protective effects of ARBs and I think we can have discussion on that at some later stage in another meeting because I do not want to quote studies because that will take time unnecessarily but my personal choice today is still, I agree with you on one point that if there is somebody with hypertension and no other risk factors and no vascular disease, yes ARB, any body else if we have to do the nephrologist will not agree with me, I know, I have had a chronic discussion with them over the years because they are only looking at proteinuria and proteinuria is only a surrogate endpoint. Most studies that have shown reduction in proteinuria have not shown reduction in cardiovascular endpoints, so we have a discussion on that as yet and we are not yet clear on that issue. As far as the beta-blocker are concerned, I want to reiterate one thing, something that was discussed in the morning and I wanted to interject in that. Recommendations of all international societies about patient on beta blockers who are going for non cardiac surgery are very clear that beta blocker should not be stopped before surgery. Beta blocker should be administered including the morning of surgery and long-acting beta blocker should be given like bisoprolol or something which has action for more than 24 hours because if you withdraw beta-blockers you will have silent infarction, you will have increase in cardiovascular mortality, particularly in the patient who are suffering from cardiac disease. This is very, very clear and must be understood. 2. The patient who are on ACE inhibitors and ARB, there has been a very recent meta-analysis which was being quoted in the morning that they may have trouble you know postoperatively because they have problems of induction of anesthesia, they get hypotensive postoperatively or during induction of anesthesia. The issue is it happens only in those people who are hypovolemic. So, if you are able to take care of the volume, it means you put the patient on an intravenous fluid, the evening before I do not think this problem comes up most of the time. Personally, I have never stopped ACE inhibitor even before you know coronary artery bypass surgery. Everyday coronary artery bypass surgery is done in my hospital, we have not recommended stoppage of ACE inhibitors and I do not think we have worsening of mortality at all. In fact I know of several instances where the patient had bad left ventricles, the ejection fractions improved, they have less renin angiotensin stimulation postoperative, and they do pretty well. Yes, one needs to be cautious that you do not produce too much of volume shifts in them and you have to manage them well, but otherwise they are good drugs and I think to write them off preoperatively, probably in my opinion is not a good idea. Dr. J.P.S. Sawhney: I do agree. One more thing, as you said some of the physicians what they do when they see they are high risk patient, preoperatively they start beta-blocker just before operation which is not required, but the patient who is already on beta blocker should not stop. Dr. Kamal K. Sethi: If you start beta blocker within 24 hours of your surgery, you will have trouble on the table, induction problem. So, that is not recommended. You have to have beta blocker on board for at least 7 days before the patient is going for surgery. Do not start it the day before, and one last comment about what is known as aldosterone breakthrough actually what you are talking about you know that patient they have proteinuria and then the proteinuria you get loss of effect of angiotensin receptor blocker or even ACE inhibitor for that matter and that is because of the fact that you start getting resynthesis of aldosterone because there is a large quantity of angiotensin 2 which accumulates in the blood when you give them ARB and when you are giving them ACE inhibitors you know there are other parallel pathways which are working like the cathepsin pathway, the tissue pathway, the other pathway and that stimulates aldosterone secretion in the adrenal glands. Interestingly, aldosterone secretion in the adrenal glands is controlled by all three types of calcium channel. It is controlled by L-type of calcium channels, P-type of calcium channels, and N-type of calcium channels and all three types of calcium channel blockers will produce some reduction in aldosterone including nifedipine if there is a breakthrough, but probably you know if you have something which blocks more than one type of calcium channel blocker there is a possibility that you might be able to use that drug in this kind of situation because at this time we do not have very clear data on that but certainly spironolactone and apart from spironolactone if you get hyperkalemia and you get into trouble with spironolactone, may be you can use cilnidipine in that situation. Do you agree with me? Dr. Prashant Rajput: Yes sir, there is a study which has been in the NDT very recently about adding those patients who are on ACE, ARBs, adding spironolactone significantly reduces the proteinuria with slight worsening of the GFR which later on tends to be stabilized and maybe improves. Dr. Kamal K. Sethi: Yes, I agree with you there that if you have transient increase in serum creatinine, so long as it remains below 25% of the baseline level and you have not produced hypovolemia in the patient and you have not given him a nonsteroidal anti-inflammatory drug, it is a good sign. Dr. Prashant Rajput: In long run these patients do well because it translates into lower intraglomerular pressures. QUESTION FROM AUDIENCE: Dr. Sethi, a short comment on ARB-MI paradox since you already raised the issue and it is hypertensive meet I think we should tell little more about ARB-MI paradox. Dr. Kamal K. Sethi: The ARB-MI paradox actually came after the ROADMAP study. It became more prominent, although it was very well known even before that. Dr. Siddharth Shah: I think we have taken the point well. Calibration of the instrument is very, very important. I would like Professor Sethi to say a few words about meeting and then we will conclude. Before that, I would like to thank the speakers for two days, all the chairpersons, and you all without which this conference could not have been successful. Professor Sethi, sir. Dr. Kamal K. Sethi: I think much has already been said and I do not have to add anything except that we would like to thank the sponsors for this program because although much has been said about sponsoring of scientific events and education and recently there has been a big noise about it in the American press. Last week I was reading something about it. It is also argued that unless good well meaning sponsorships are conducted ethically there cannot be an advancement of knowledge. You have to bring people together on platforms and the only thing is that we have to ensure that we do it in an ethical manner, we do it in the correct way and we do it for correct people. That is what I would like to request to all sponsors of education that they should continue to do that and unless we bring in multiple specialists together, people with multidisciplinary interactions who are trying to deal with the same disease, there is no opportunity to learn from each other. For example, I hardly meet a nephrologist in my day to day clinical practice except then when he comes to see a case of acute shut down in my coronary care unit, writes some thing, and walks off in 5 minutes. You do not have a time to interact with people and where is a time for me to read Kidney International all the time. So it is difficulty. I mean the literature in cardiology so much and therefore there is so much of opportunity. You see somebody who manages diabetes, he is speaking in a forum you learn so much from there. You will see a nephrologist talking about something, you learn so much from there. You see a physician talking about something, you learn so much from there and that is to my mind the major advantage of getting people together and we must have a free mind, express ourselves and even if we are wrong, I have been wrong on number of occasions, I have never felt shy in expressing myself. Unless you express yourself you never correct yourself and that should be the philosophy on which we should work.